I guess some of you may be wondering what UV means in “UV Express Service”. Here’s the deal, the ” UV Express Service ” is one of the passenger services in Manila carrying you straight from one point to another point with no stops. It can usually carry around 15 to 18 passengers all crammed inside like a can of sardines in a van having a capacity of 12 passengers only… Speaking of extreme overloading worthy to be recorded in the Guinness Book of World Records! Looking at what’s inside this van, now I know why it’s called “UV Express Service”. Passengers are extremely bombarded with a massive dose of “ultra-violet” rays to get a sun-tan in a jiffy. Express tanning service while on commute, I suppose. I guess the local vampires we have bleeding the life out of the Filipinos by taxing them to death will have to fly as a bat rather than burn themselves riding one of these UV Express Service. Do you know where Van Helsing is so we can hire him to rid our country of these vampires? 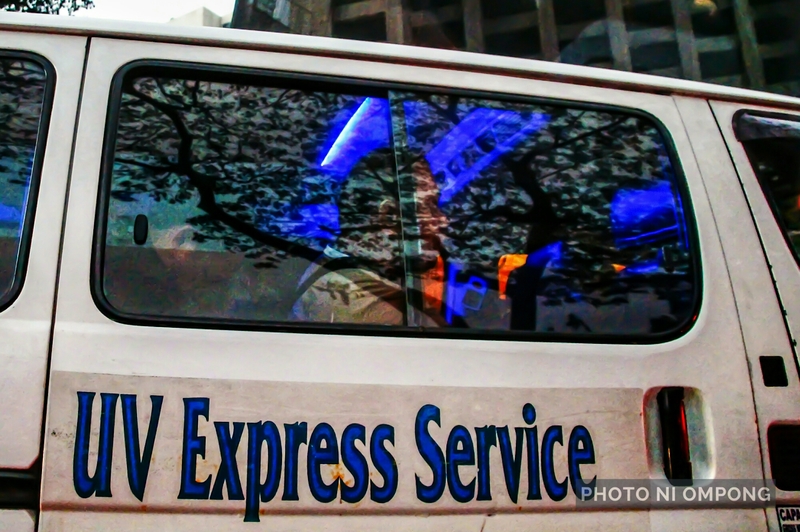 But wait, there’s more… UV could also mean “ultra-violation” as UV Express services are known for their traffic violation stunts in Manila with some of their drivers working as police or army personnel as their “day job” while moonlighting as UV Express drivers at the same time. Talking about multi-tasking… ‘Nuff said! ouweeeeeeeeeee! I came up with another good UV definition!